The 2017 NFL Draft invites families and fans of all ages to enjoy FREE admission to a three-day football festival held along a half-mile stretch of the Benjamin Franklin Parkway from Thursday, April 27 - Saturday, April 29. Fans of all ages and of all teams will be able to participate in interactive exhibits, immersive games, and virtual reality experiences, free player autograph sessions and more. The event will be open to the public from 12pm-11pm on Thursday, April 27th and Friday, April 28th. Hours on Saturday, April 29th are 10am-6pm. The NFL Draft Experience is free and no tickets are required. Fans are encouraged to visit the event website for information. In addition, most of the cultural institutions along the Benjamin Franklin Parkway will maintain normal hours of operation and, in some cases, even extend schedules during the event. Many institutions will also offer special discounts during the Draft. Details on hours of operation, access and special offers at Parkway institutions are outlined below as well as road closure and parking information. The full set of closures on the Parkway and in the immediate vicinity are scheduled to be implemented by 12:01 AM on Tuesday, April 25th. The full extent of these closures will be in place until 5:00AM on Monday, May 1st. There are multiple phases of partial road closures that will precede and follow those dates. A detailed list of closures and restrictions by phase is listed below. A full map of the road closures imprint for the Draft is available upon request. Email press@phila.gov. - Spring Garden Street westbound will close at Pennsylvania Avenue. 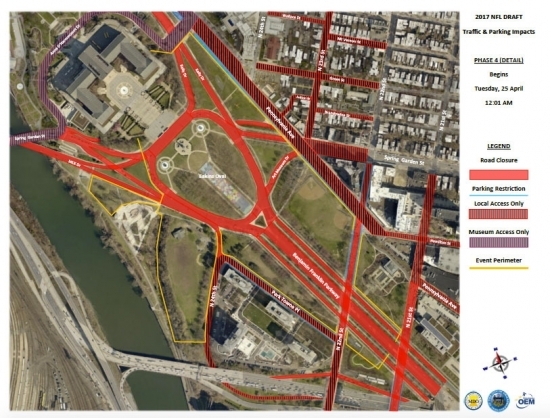 - The westbound center roadway of Benjamin Franklin Parkway will maintain two lanes from 20th Street to Eakins Oval. The left lane of Benjamin Franklin Parkway will be closed from East Eakins Oval to Spring Garden St. and continue to southbound Kelly Drive, where it will open up to three travel lanes. - The right two lanes of Eakins Oval in front of the Art Museum steps will be closed for the building of the theatre. - Southbound Kelly Drive will have a lane drop between 25th St. and Benjamin Franklin Parkway. - Inner lanes (inbound and outbound) of Benjamin Franklin Parkway closed from Eakins Oval to 20th Street. - Benjamin Franklin Parkway will be closed from 20th Street to the Art Museum. - Martin Luther King Drive will remain open to 24th Street. - Eastbound Spring Garden Street will remain open from 31st Street to 24th Street. - Kelly Drive will be closed at Fairmount Avenue with traffic detoured onto Fairmount Avenue and Pennsylvania Avenue. - Martin Luther King Drive closed at Sweet Briar Drive. During the NFL Draft Experience, the west entrance of the Philadelphia Museum of Art will be open and visitors may obtain access via pathways north and south of this entrance. Anne d’Harnoncourt Drive will be open at 25th Street, with access to the museum’s parking garage for museum visitors throughout the week. The south entrance to Anne d’Harnoncourt Drive will remain accessible via the Spring Garden Street Bridge for museum visitors only. Signage will be prominently displayed with directions. Regular operating hours: Thurs. April 27th and Fri. April 28th, 10:00 am – 4:30 pm; Sat. April 29th, 10:00 am – 5:00 pm. On April 27-29, the Academy will offer free general admission to the museum to all visitors. In addition, an $8 Super Saver Ticket will be available for the special exhibits. Visitors who wear an NFL jersey, get $1 off the Super Saver ticket. Their special exhibit is Frogs: A Chorus of Colors, featuring 15 species of live frogs (on view through May 14). The historic site will remain open with regular hours – 10 am to 5 pm daily. Hours: The Franklin Institute will be open to the public from 9:30am-5pm during NFL Draft days (April 27-29). Parking: The Franklin Institute’s parking garage entrance is located at 21st and Winter Streets, street parking and public transportation are strongly encouraged. Special Offer: The Franklin Institute is offering a $2 discount on adult general admission for adult visitors wearing NFL team gear during draft days (April 27-29). Parkway Central Library welcomes NFL fans to experience guided tours of their 90 year-old beaux arts building and its world-renowned Rare Book Department. Daily tours are at either 10:00 a.m. or 2:00 p.m. Rare Book Department tours start at 11:00 a.m. While in the Rare Book Department, be sure to check out their latest exhibition, Becoming the Detective, which explores the development of fictional detective stories and their relationship with readers. For hours of operation, go to www.freelibrary.org. The Art Shop at Moore (215-965-8586) will be open April 27-29, 10:00 am – 6:00 pm, The Galleries at Moore (215-965-4027) will be open those days, 11:00 am – 5:00 pm. Open: Tuesday–Sunday, 10:00 a.m.–5:00 p.m.
Wednesday and Friday open until 8:45 p.m.
Rare embroideries from north central India and eastern Pakistan showcasing a vibrant tradition shaped by women and passed down through generations. Open: Wednesday–Monday, 10:00 a.m.–5:00 p.m.
A new installation devoted to The Kiss explores what passion looks like in the hands of a master sculptor. It explores the artist’s intimate and powerful depictions of romantic love.